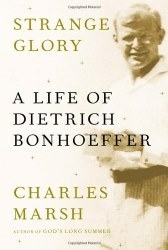 Strange Glory: A Life of Dietrich Bonhoeffer. Charles Marsh. New York: Alfred A. Knopf. 2014. ISBN 978-0-26981-2 x + 515 pages. $35.00 (Kindle $14.39). This new biography on Dietrich Bonhoeffer promises to please readers on a number of different levels. Marsh’s talent for storytelling comes through in his literary writing style, by which the Teutonic settings and exotic travels Bonhoeffer enjoyed come to life with fresh vigor. Moreover, connoisseurs of the German theologian will find a treasure trove of new material, ranging from anecdotes, pictures, and postcards to additional contextual information that lend greater shape to the world he inhabited. These attest to Marsh’s rigorous source work, which updates the labor of previous biographies. Scholars in particular will appreciate Marsh’s veteran handling of theological concepts, as he both translates them for a broader audience and respects their complexity. In this way, Strange Glory boasts a rare combination of artistic and scholarly acumen. Most welcome is Marsh’s effort to discover Bonhoeffer’s personality. In contrast to common hagiography, this biographer presents the less desirable characteristics of his subject along with the good. Unexpected moments of immaturity, loneliness, indecisiveness, as well as arrogance, fear, and a “volcanic temper,” are coupled with the conviction, faithfulness, and courage, which came to define him. Humorous personal details – such as Bonhoeffer’s relentless sartorial obsessiveness or cheeky habit of sending laundry home via the post – grant an endearing quality to the reserved German intellectual. The resulting portrait balances the myth with the realities of the man. Readers will be surprised to learn, for example, that Bonhoeffer entered the resistance in large part as a means of escaping military conscription. Similarly, Bonhoeffer’s stints with German nationalism and “stumbling” over the “Jewish Question” in his youth show the experiences and development that led him to his stark opposition of the Nazis. Far from discrediting the protagonist, Marsh’s doses of realism demonstrate Bonhoeffer’s incredible capacity to adapt to the intractable situations that surrounded him. One learns a greater admiration for a normal man who overcame life’s obstacles rather than an unattainable hero or saint, as he has sometimes been portrayed. A distinctive feature of this biography is its closer examination of Bonhoeffer’s close friendship with Eberhard Bethge. More so than previous accounts, Marsh incorporates Bethge into the narrative as a character in his own right. To date, biographers have acknowledged the profound impact of this relationship on Bonhoeffer, as evidenced especially by his landmark theological prison letters, which are addressed exclusively to his former Finkenwalde seminarian. Marsh inquires further, however, into the exact nature of Bonhoeffer’s feelings for Bethge. Although tactfully never putting a name to such feelings, he nevertheless insists on the question. Despite Marsh’s implicating interpretation of the fact s and correspondence, the matter remains complex. For one, it must be recognized that our modern conceptions of homosexuality cannot be superimposed onto Bonhoeffer’s time, where the norms of male relationships would have been entirely different. Certain behaviors, such as sharing a bedroom or bank account (only two of the many examples provided), would not raise the questions then that they may now. Our intensified cultural sensitivity to this topic should not provoke assumptions about a culture and time significantly distinct from our own. Moreover, several factors in Bonhoeffer’s life complicate this claim. Whether actively, as in the case of his eventual fiancé Maria von Wedemeyer, or passively, as in his epistolary exchange with Elizabeth Zinn, Bonhoeffer pursued romantic relationships with women. His love letters to Maria contain such moving affection that renders the authenticity of his emotion undeniable. In the same vein, Bethge maintained a clear platonic stance towards his friend. Although ever a faithful and obliging companion, Bethge resisted Bonhoeffer’s possessiveness and prioritized his marriage over his friendship. Ultimately, such retrospective speculation proves futile, as we will never know what exactly Bonhoeffer felt for Bethge, except the obvious fact of close friendship. Indeed, it would behoove us to heed Bonhoeffer’s warning against such prying psychological curiosity. What then, are readers to make of this possibility? Nothing much, in this author’s opinion. The conjecture changes nothing of the enduring impact of Bonhoeffer’s life and theology. Altogether, Strange Glory presents a stimulating new account of Bonhoeffer’s story. Marsh invites readers to encounter the paradoxes and perplexities of his subject without offering any easy resolve. Provocative questions and alternative interpretations are risked to shake prior conceptions of the theologian and allow space for new ones. As Bonhoeffer once preached, “It is a strange glory, the glory of this God.” Here is an unfamiliar and sometimes unsettling rendition of a well-known tale. Readers are sure to rejoice in the strangeness of this glory. Roger Revell, A Review of DBWE 15 - Theological Education Underground (1937-1940) Rev. Roger Revell, Th.M. Bonhoeffer as Youth Worker Jason Okrzynski, Ph.D.